China's environment authorities have vetoed a controversial hydro-electric project in Chongqing to protect what experts believe is the last habitat for some endangered fish species along the Yangtze River, a rare rebuff to pressure from local governments and State-owned companies, environmentalists said. 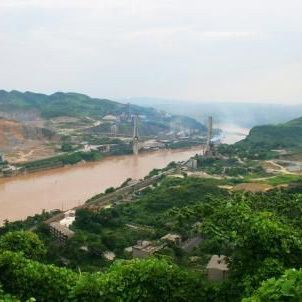 The Ministry of Environmental Protection (MEP) vetoed the Xiaonanhai dam on the westernmost major headwater stream of the Yangtze River, saying that planning and construction of any dam or barrage in the river's mainstream and tributaries between the Xiangjiaba dam and the Three Gorges Dam will be forbidden, according to a document issued on March 30 obtained by the Global Times on Thursday. The document was addressed to the State-owned China Three Gorges Corporation, which is responsible for the Xiaonanhai dam. To exclude the area that the Xiaonanhai project covers from the Upper Yangtze Native and Rare Fish Reserve, the boundaries of the nature reserve were redrawn in 2011 when Bo Xilai, who received a life sentence in 2013, was the Party chief of Chongqing. Chinese environmental NGOs have been opposed to the dam since 2009 when Chongqing first revealed plans for its construction. Authorities admitted that the structure and function of the nature reserve have been tremendously influenced after the boundaries were redrawn, while stressing that the ecological red line should be strictly observed, read the document. "The remarks are strongly-worded, which was rarely seen before the new environmental law - dubbed as the strictest - came into effect on January 1," Xia Jun, a lawyer with the Environment and Resources Law Committee of the All China Lawyers Association, told the Global Times. The ban demonstrated the MEP's determination to defend ecological red lines, which were drawn to limit economic development in environmentally vulnerable regions. The lines had sometimes been blurred by local governments and businesses, said Zhang Boju, secretary-general of the Beijing-based Friends of Nature, who led the campaign against the dam. The Xiaonanhai project was projected to cost 32 billion yuan ($5.16 billion), which was believed to drive GDP growth in Chongqing. The amount of electricity generated by the dam was expected to reach 10.2 billion kilowatt-hours annually to save some 5 million tons of coal and ease the power shortage in the municipality of about 30 million people, business magazine Caijing reported in 2012. The new environmental law granted environmental protection authorities more say over local governments and major companies during the project approval process, Xia said.